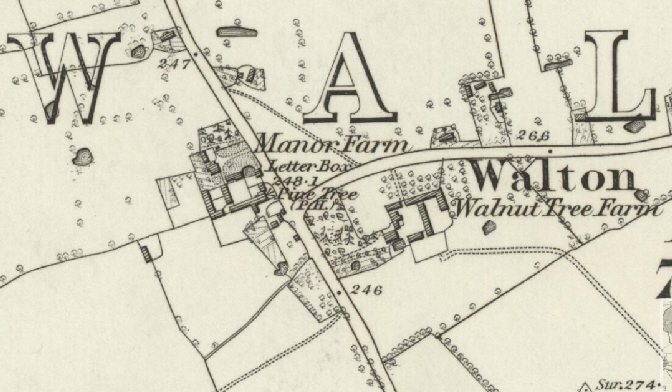 An inn once stood in the parish of Walton, just west of Wavendon, and opposite Walnut Tree Farm. The farm is still there, but the modern Milton Keynes gridroad of Brickhill Street is set slightly more to the east than the old road going north was, meaning the site of the pub is now part of the MSD Animal Health site (formerly Hoechst site). 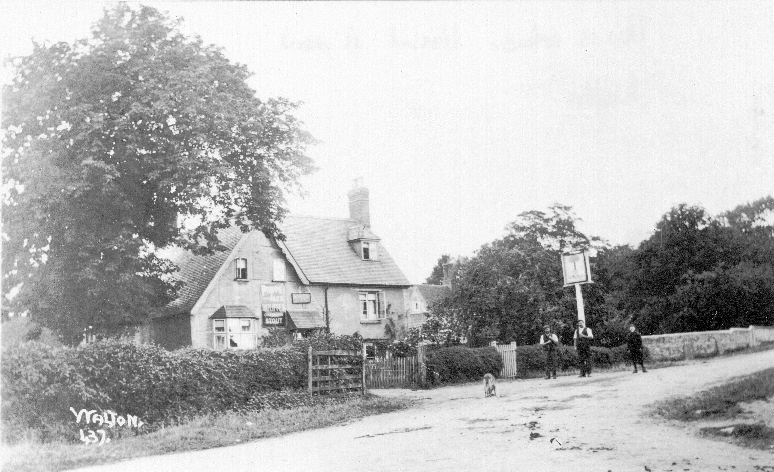 The nearby small thatched building still on the site today once stood on the east side of the old road. Many inns were attached to farms, and this one was almost certainly part of Manor Farm originally. I think farms would brew beer for their thirsty workers, and if you made enough of it, you could sell some to passers-by to defray the costs. An inn is mentioned at Walton in a coroners report from 1378, being run by Peter Bray, but no inn name is given. The de Bray family were Lords of one of the local Manors in the 1200’s, so there is likely to be a connection. When the Bucks Alehouse Register starts in 1753, there was an inn recorded in Walton called “The Queens Head”, which was run by Joan Cook. For the years 1768-74, Thomas Smith was the landlord, but no inn name was recorded. However, it had become “The Sugarloaf” by 1776, when William Hooton took it until 1784, with Thomas Huneyburn taking over for another four years, up to and including his last year here when the name changed to “The Angel” in 1789. Other landlords were William Hughes (1792-93), Mark Morris (1794-98), George Lancaster (1799-1800), it was not listed in the Register for the years 1801-03, then Samuel Smith (1804-13) and Edward Parker (1814-27). 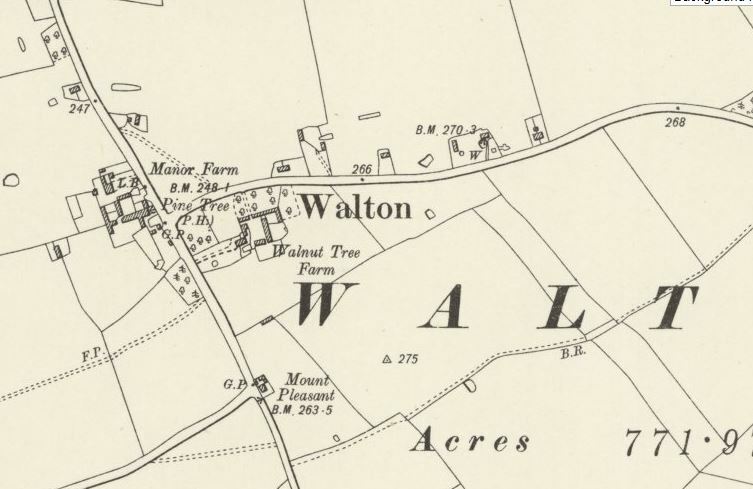 By the time of the 1838 Tithe map for Walton, John Lightfoot in charge of “The Angel”. He ran the inn and also had an orchard a little further north on the road, and both were leased from the Pinfold family of Walton Hall. He, and then his son, would see the inn through to its closure. There is no sign of the Lightfoot family in Walton before this time, and the 1841 census shows he had been born in North Crawley. John and Martha Lightfoot are listed, aged 55 and 35 respectively, with Johns’ father, also called John, aged 90, and two employees. A John Lightfoot died the next year in the Newport Pagnell area, which I presume was John Lightfoot senior. 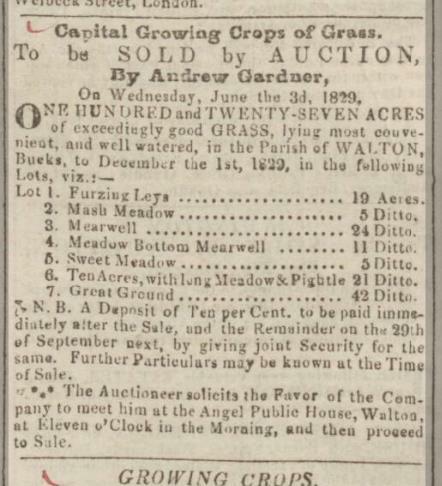 In total, Walton had just 103 inhabitants at this time. There was one inn, one shopkeeper, a parish clerk and two farmers listed in a directory of that year. The rest was made up of cottages for farm workers, or those who served in Walton Hall or Manor. On the 10th April 1845, John and Martha gave birth to a son, which was recorded in the Northants Mercury. There are two other early news reports concerning John Lightfoot. There is a report in the Bucks Herald for 16th March 1844 that John Warr had been charged with stealing three fowl belonging to William Linnell of Fenny Stratford. He had sold some of them to John Lightfoot, the publican of Walton, for 3s 6d. Warr was committed for 6 months hard labour. Then in October 1847, a labourer named William Barker obtained victuals and drink from John Lightfoot by claiming his employer, Mr Knight of Woughton on the Green, would pay later. However, when Lightfoot asked Mr Knight about the debt, he said that although he had previously employed Barker, he wasn’t currently, and so would not pay. Lightfoot took Barker to court, and he was found guilty of obtaining the goods by false pretences and sentenced to 6 months hard labour. The inn name wasn’t used in any of those articles, but it appeared named as “The Angel” in the 1848 Kellys Directory. In the 1851 census John said he was 63, which does not correspond with age he gave in the 1841! Martha was 44 and their son William was now 5. There was also one female servant, surnamed Kemp, who was 17 and a farm labourer lodger, George Leach, 34. John Lightfoot died in December 1856, “after a long and painful illness…” Walton Church burial register gives his age as 73. Now widowed, Martha was listed as Head of the household in the 1861 census, aged 54, with her son William, 15. There was also Mary A Leach, a servant aged 20 and William Leach, 21, an agricultural labourer, who were listed as niece and nephew to Martha. This census records the inn name for the first time, which had by now changed to “The Pine Tree”. 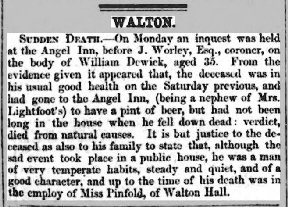 I thought perhaps Martha had decided to rename it after the death of her husband in 1856, until I found the newspaper report below, from 1859, when it is still clearly called “The Angel”. Maybe after the death of a second family member, “Angel” wasn’t seen as very appropriate! However, there are several auction adverts in the newspapers of 1864 that use the name “Angel” still, so it is not clear exactly when the name changed. The inn appears in Duttons Trade Directory for 1863, run by Martha Lightfoot. This shows the inn was still owned by the Pinfold family. They owned the whole Walton Hall Estate, which surrounded the inn. A pine tree was part of the family crest of the Pinfold family. Certainly, when Walton Hall was sold in September 1864, it contained a brewhouse, as the auction advert states “The Brewhouse contains a 100-gallon brewing copper, 30- gallon ditto, 20-bush el mash tub, beer coolers, brewing tubs, 4 new 60-gallon iron-bound ale casks, beer stands, &c.; six dozen churn and stand, two-dozen ditto, milk pans, butter kivers, &c., &c. Many of the Implements and Effects are new, and of excellent manufacture.” So perhaps they were supplying the inn. The 1871 census shows Martha still in charge, now 66, and her son William, 26, along with his wife Elizabeth, a dressmaker, aged 28, whom he had married in December 1869. (Maiden name Eastman, she gave her occupation as School mistress) They had a three month old daughter, Margaret. Both Elizabeth and Margaret were stated to also have been born in Walton. A Licencing Report was made in 1872, showing Martha was still there, which also recorded it had been in existence for at least 50 years. In February 1875, Martha transferred the licence to her son, William. (She died August 1877, aged 73) Also in April 1875, Thomas Garner was charged with using a snare on the lands of William Lightfoot, Walton, possibly their orchard? The owner of the Walton Hall Estate, Fanny Maria Pinfold, died childless, and had been ‘declared of unsound mind‘, so bequeathed the area to a Miss Seagrave, a relative on her mothers side. In the 1881 census, William was the now publican, with his wife Elizabeth, and their daughters Margaret Elizabeth, 10, and Frances Ellen, 6. Thomas Bonner, 15, William’s nephew was also staying with them. Some accounts papers at the Centre for Buckinghamshire Studies (CBS) shows the inn was rented for £24 a year in 1889. In the 1891 census, William, and Elizabeth and their youngest daughter are there, but the older daughter Margaret has left home. Thomas Bonner is still there, now listed as a domestic servant, and one lodger, John Ruffelt, listed as a gamekeeper. The photo above, (kindly supplied by Centre for Buckinghamshire Studies) shows the family stood at the door of the inn, and comes with the following information. Back row, left to right: Thomas Bonner (nephew of William Lightfoot); Francis Ellen Lightfoot (organist in Walton Church for 10-12 years. She went on to have one daughter, called Daisy) William Lightfoot; Margaret Lightfoot, (who married a George Graves, but had no children). 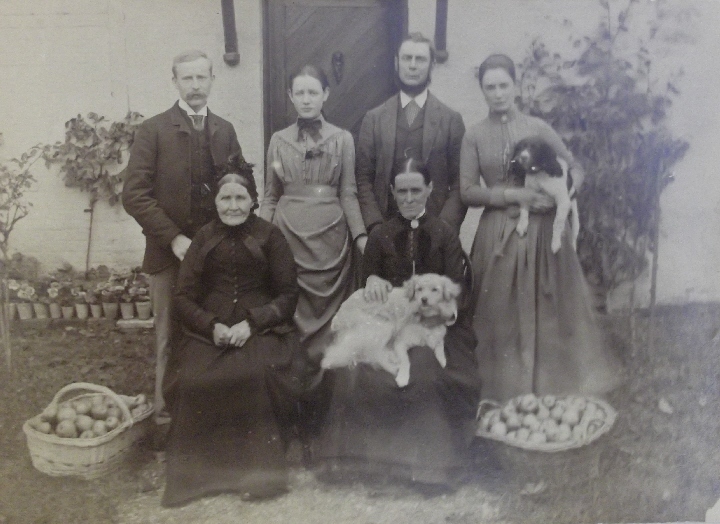 Front row: Elizabeth Lightfoot’s mother (who lived on Wavendon Road); Elizabeth Lightfoot (seated with dog). The two baskets of apples at their feet support the information that the inn sold homemade beverages, and I presume it was a good inn for cider! The next census in 1901 shows just William and Elizabeth living there alone. 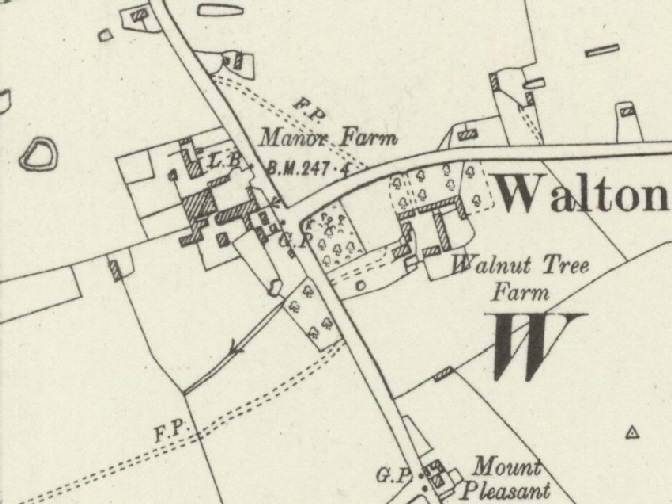 Two years later, Miss Seagrave sold up the Estate, selling Walton Hall itself, the Manor Farm, Walnut Tree Farm, Bodley Farm, the inn and also 16 cottages, which all stood on a total of 716 acres. The whole estate was offered for £15,000, but no-one wanted it all, so it was split into separate lots. The Hall itself, and land around, did not get enough interest and were withdrawn, as was Bodleys Farm, but Walnut Tree Farm sold for just over £2000. It was purchased by Phipps, the Northampton brewers, for £410. Most of the other lots sold too, and a total of £13,180 was raised. Their youngest daughter Frances Ellen got married in 1904, to Capt. Frank Poulton of the Church Army in Luton. The wedding news report says her elder sister was present, and that the bride was held in high esteem by all who knew her. The local Walton cottagers gave her a Silver Teapot as a Wedding gift. She listed her fathers trade as ‘Farmer’ in the marriage register. The end for the Pine Tree Inn seems to have come in 1909. 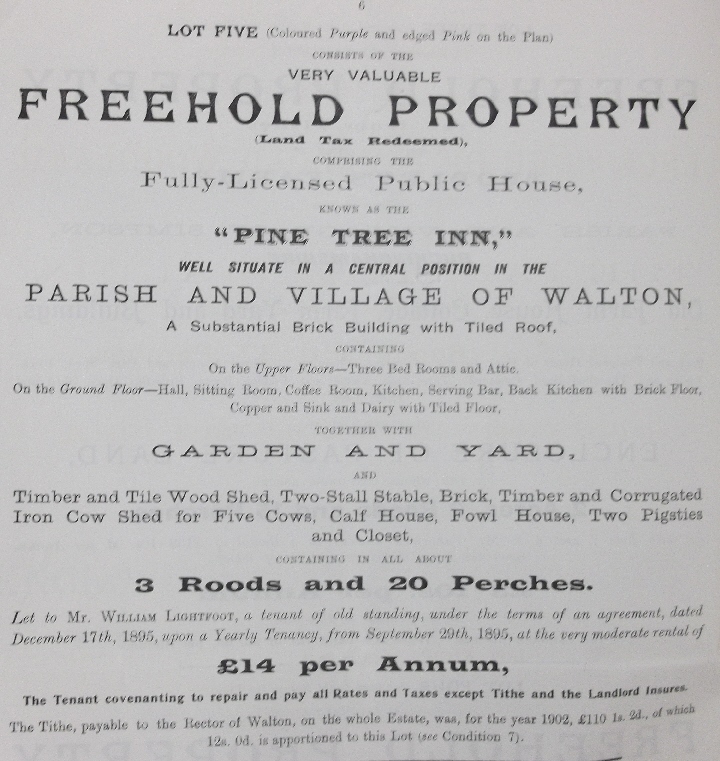 The Northampton Mercury for 5th February 1909, reported that at the Licensing Session, Mr L. H. Wells, of The Red House, Newport Pagnell applied for the removal of the full licence held by Mr W. Lightfoot of The Pine Tree, Walton, to the Red House, now only a Beerhouse. This was dismissed, as the bench said there were “technical difficulties”, but obviously, they were trying to transfer its valuable Full License to lessor houses. By the time of the 1911 census, William and Elizabeth are living in Church End, Wavendon, but I have not yet been able to find their deaths. I presume the inn closed at the time they left it, as I cannot find any later references to it. At CBS there is a inventory for the inn, of fixtures and fittings being transferred from William Lightfoot to Dr Vaughan Harley. He was of the family that Harley Street in London was named after, and had bought Walton Hall in 1909. The entire remaining contents of the inn were listed as “8 Blinds, 5′ 6” Deal dresser in Bar, Shelves in dairy, Trestle and Boarding in Dairy, 18 Gall. copper furnace and a Deal shelf”… so it looks like the inn had been completely striped out by the Lightfoots before this. Wigleys Auctioneers priced the remains at £4.10s. It would seem that although Phipps Brewery had bought the inn in 1903, it was back in the hands of the owner of Walton Hall by 1909. I wonder if Dr Harley, being a medical man, had decided that an inn was not a good business to be benefiting from, and had it closed? There is a hall, a little further to the north, now used by a Milton Keynes Cyclists Club, that bears his name over the door. Perhaps he built this as a village community hall after the iinn closed and the villagers had nowhere for meetings etc? The inn building was converted into two cottages, and survived until the city of Milton Keynes began to be built in the late 1960’s, when they were demolished. The names Lightfoot, Pinfold, and Seagrave live on as roads names in the new Milton Keynes estates.